187 Merrijig offers two very private suites in a newly renovated wing of the property. While you might be in the High Country, the luxurious interiors wouldn’t be out of place in the most cosmopolitan city. Each suite features contemporary furnishings, vibrant art and floor-to-ceiling windows to take in the spectacular views of the Delatite Valley. The suites have ample space for you to spread out in and feature a choice of sitting areas, including a lounge, dining area and private outdoor terrace heated by Euro fireplaces. Your minibar comes stocked with beer, wine and produce from the region and each room has a Nespresso coffee machine and selection of Harney & Sons Fine Teas. 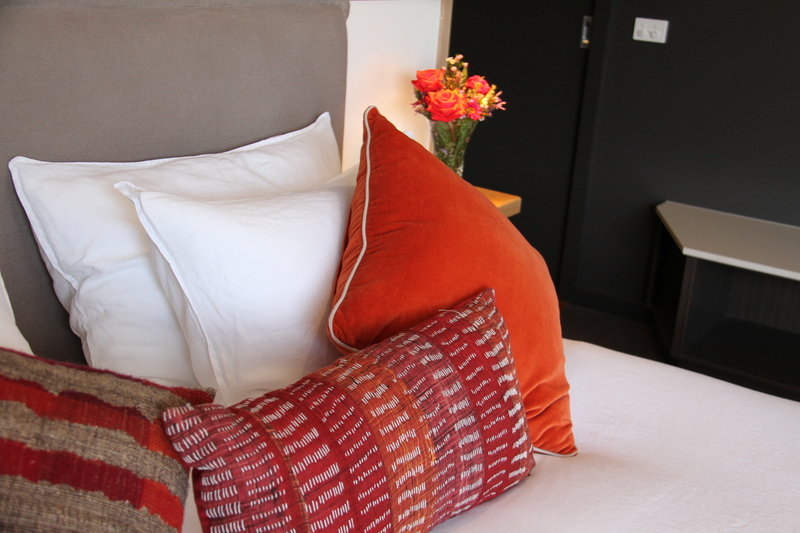 Slumber is sweet on your king-sized bed made with French linen and a choice of pillows. It’s the perfect spot to kick back and catch up on that TV show or movie you’ve been meaning to watch on Netflix. For a touch of playful chic, you can set the tone in the bathroom and choose from a full spectrum of colours with the LED lights. After a soak in the freestanding tub or rain shower, step out to warm floors with the underfloor heating for the cooler months. You’ll emerge refreshed and revitalised after using the locally sourced and completely natural bath amenities, featuring virgin olive oil, nourishing plant butters, pure essential oils and organic herbs. The terraces give guests access to the stunning heated outdoor pool where you can spend a lazy afternoon on the designer lounges and bean bags while sipping on a glass of local prosecco.